Monica Eng, Chicago Honey Co-op, and Community Shares Project of Rogers Park are among the 2013 Golden Beet Award winners named at the Illinois Stewardship Alliance’s annual Harvest Celebration in Springfield on Sunday. 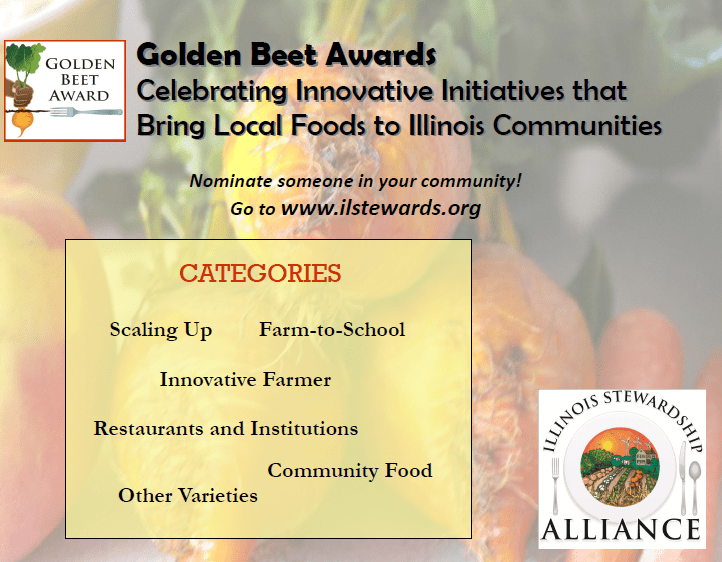 The Golden Beet Awards grew out of a desire by Illinois Stewardship Alliance to highlight ingenuitive local food practices so that they might get the recognition they deserve, and so that they can serve as a guide for others. “There are so many people doing really exciting and original things when it comes to local food. A lot of time those people don’t get any recognition, let alone the recognition they deserve. We think of the Golden Beet Awards as a way to highlight some really special people and draw people’s attention to what’s going on with agriculture in the state,” Wes King, Illinois Stewardship Alliance executive director, said. Illinois Stewardship Alliance solicits nominations from the general public for the following categories: farm to school; restaurants and institutions; community food projects; innovative farmer; scaling up; and other. A committee then goes through the nominees and decides on the winners in the specific categories. The committee can decide not to give an award for a certain category if the nominees for a category don’t fit within the Golden Beet parameters. Name: Community Shares Project of Roger Park. The Community Shares Project is a cutting-edge community food access program. A collaboration of Glenwood Sunday Market, St. Ignatius Church Food Pantry and Christopher House, the project purchases Community Supported Agriculture shares from the farmers of Glenwood Sunday Market and gives the food away at no charge to food insecure Rogers Park families. Rogers Park is the most diverse neighborhood in Chicago where nearly 50 percent of children under the age of five live below the poverty line. Community Shares includes an educational component presented in English and Spanish that helps the participating families learn how to incorporate more local, fresh fruits and vegetables into their everyday diets with the goal of helping families develop and maintain a healthy lifestyle. This unique project purchased 15 CSA shares from local farmers in its first year (2012) and gave away the 3,000 pounds of produce to more than 100 food insecure families. Since 2004, Chicago Honey Co-op has been a pioneer in urban beekeeping. Officially becoming an Illinois registered agricultural cooperative in 2006, it uses cooperative principles as a guide to foster greater understanding of the honey bee’s place in an urban environment, the close relationship between pollinators and the food supply and the good that can come from deep community relationships. One of three founding members and a lifelong beekeeper, Michael Thompson has been mentor to a countless number of students, trainees, neighbors, and new beekeepers. His commitment to sustainable chemical free agriculture has been a hallmark of the Co-op’s mission. The honey that results from this work is just a bonus that helps enable it to continue. Monica was nominated in recognition of her focus on cooking, health, sustainability and local food in her writing for the Chicago Tribune. Her in-depth coverage of the local and sustainable food scene, her efforts as a watchdog reporter as it pertains to food issues as well as her writing on subjects ranging from traveling to a farm to procure a live turkey for Thanksgiving to butchering a whole hog has given her readers an unvarnished look at food. Illinois Stewardship Alliance is a nonprofit that promotes environmentally sustainable, economically viable, socially just, local food systems through policy development, advocacy, and education. or follow ISA on twitter, @ilstewards.